Ireland Park Foundation and Celtic Studies at Univeristy of St. Michael’s College, in the University of Toronto, are delighted to host Dr. Jason King. Dr. King is Head of the Irish Famine Archive and Researcher for the National University of Ireland, Galway. He will deliver the annual Ireland Park Foundation Lecture, on the lives of Stephen De Vere and Robert Walsh. In 1847, Stephen De Vere risked his life sailing with former tenants from his Irish estate in the steerage of a coffin ship. In Toronto, he wrote such an influential description of the Irish Famine migration that it shocked British Parliamentarians into reforming the Passengers Acts to protect emigrants at sea. Yet the fact that he kept extensive, unpublished diaries of his voyage to Canada in 1847 and 1848 remains largely unknown. This lecture takes the audience on a tour of famine era Toronto and Ontario as seen through the eyes of Stephen De Vere and his unpublished journals. It also tells the stories of Irish Famine orphans in Toronto, like Robert Walsh, who studied at the University of St. Michael’s College. As an Irish orphan in Canada, Robert Walsh dreamed of returning to his homeland and becoming reunited with his baby sister, who was left behind with relatives in 1847. “My sister, my dear sister, if she exists, when she would learn that she has a brother and sisters in Canada who are thinking of her she would write to them,” he hoped. “We will see then we are not alone in the world, and it is this thought that will give us courage to endure our separation here.” And yet, when Robert Walsh finally returned to Ireland in 1872 he was distraught to discover no trace of her, and died soon thereafter at the age of 33. The lecture recounts the search for his sister and reveals how she was finally found. After this lecture, there will be a round table discussion between Dr. King, Dr. Mark McGowan and Robert G. Kearns. Dr. Jason King has recently become Historical Advisor to the Board of Ireland Park Foundation. 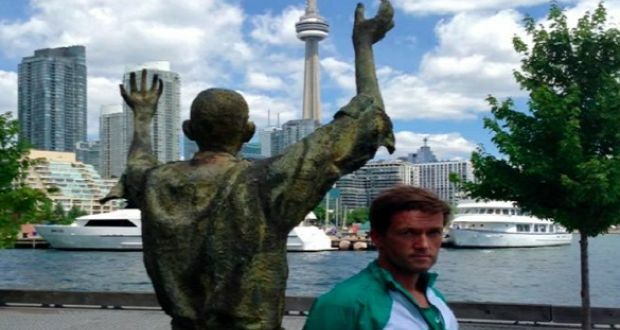 Michael Collins arrives at his final destination, Ireland Park in Toronto. 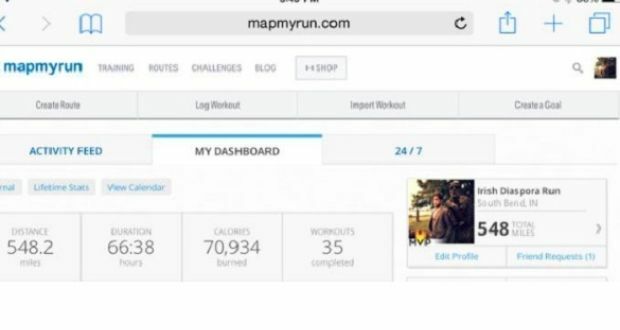 Total miles run, overall time and calories burned by Michael Collins on his Diaspora Run. Patrick James White and Michael Collins at Courtice, Ontario. Coffin Ship memorial in Ireland Park, Toronto. 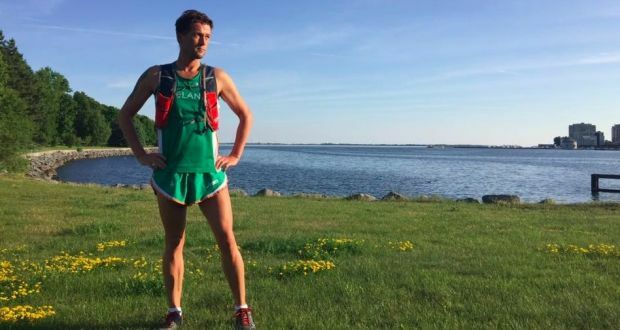 The Irish Diaspora Run saw Michael Collins run almost 900km between June 10th and July 10th, from Grosse Île to Toronto, tracing the steps taken by thousands of Irish immigrants who fled the Famine in 1847. This is the last of his weekly updates for The Irish Times. 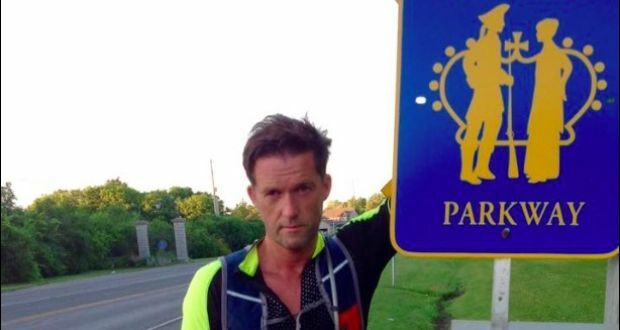 On July 10th, I ended my month-long solo 550-mile (885km) run from the Grosse Île quarantine station to the Famine Memorial at Ireland Park, Toronto. In so doing, I passed through the provinces of Quebec and Ontario, hugging the Saint Lawrence in a solitary pilgrimage, retracing the fated journey of some 100,000 Irish who, when faced with eviction and starvation, boarded what would become the infamous coffin ships of the 1847 passage to Canada. Of those who left, one-fifth – some 20,000 – died. Thousands found a watery grave in the stormy Atlantic, whilst the aggregate death toll on Canadian soil would rise as piles of corpses were buried in mass graves along the Saint Lawrence. Over 5,000 souls perished at the quarantine station of Grosse Île, while about 75,000 immigrants who survived quarantine eventually advanced on Montréal, with a then population of 50,000. In the fever sheds at Pointe Saint Charles, another 6,000 died and were interred in a mass grave that went unmarked until workers uncovered the site in 1859 during construction of the Victoria Bridge and erected at their own cost The Black Rock to memorialise those who died there. 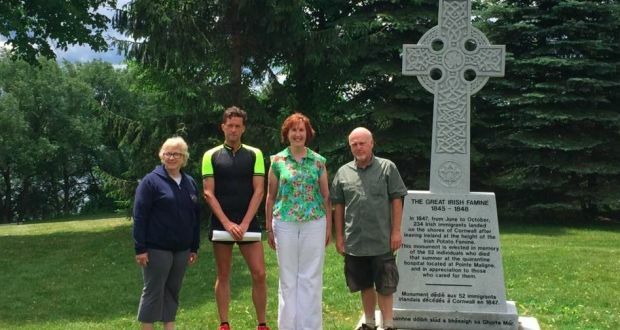 After covering over 310km the first week, I stopped at The Black Rock where I was greeted by the Montreal Irish Memorial Park Foundation and Canadian parliamentarian, Marc Miller. Both the foundation and Miller are committed to advancing the Foundation’s proposed memorial park which will include a museum, monument, and GAA pitch. Indeed, the heroism of both secular and religious groups who tended to the sick in the hastily erected fever sheds bears testimony to one of the most harrowing stories of The Great Hunger. Undoubtedly, the most vulnerable surviving victims were the orphans of those who had perished. Numbering in the thousands, these unfortunates would eventually swarm the fever sheds from Québec City, through Montréal and Kingston, and down into Toronto. In the province of Québec alone, over 3,000 Irish orphans were cared for by charitable organisations, including the Grey Nuns. Priests who ministered to the sick and witnessed firsthand the tragedy of so many dispossessed orphans delivered powerful sermons, beseeching their congregations to adopt these orphans. Exemplary of a Catholic rhetoric of compassion and religious injunction to charity, stories survive anecdotally of church doors being bolted until those less inclined to adopt an orphan were eventually persuaded. Such were the times – and the need so great – that the dutiful obeyed. The subsequent decision by the French-speaking Québécois to allow the orphans to keep their Irish surnames would become an integral part of the Canadian immigration narrative, exemplifying what historian Jason King describes as a narrative “of accommodation rather than assimilation…” which would come to define “the process by which immigrants and cultural minorities become integrated into Canadian society”. Michael Collins and Jason King at Rowan Gillespie Famine Monument in Custom House Quay, Dublin. Throughout my journey in the province of Québec, this notion of accommodation over assimilation best characterises the province’s history. The survival of the French language, French culture, and Catholicism, post the British conquest at the Plains of Abraham in 1759 are prime examples of accommodation over assimilation. 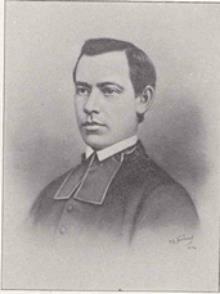 As a general observation, the French Québécois response to the plight of the Irish was borne of a religious commonality, and, though orphans were adopted in unprecedented numbers and allowed to preserve their heritage, most Irish who passed through Montréal were intent on eventually reaching America, via Toronto. The lasting effect of Irish immigration into Canada is more evident in Ontario. Through the 1820s and 30s, in what was then called Upper Canada, waves of immigrant Irish were transported from Protestant-held estates in Ireland, in a conscious attempt at instituting a sort of act of enclosure aimed at depopulating the Irish countryside to advance large-scale agriculture. In the economic doldrums of the post-Napoleonic Wars era and following the Act of Union, Protestant agents such as the inimitable Peter Robinson were commissioned to transport the Irish to settle and cultivate the Ottawa Valley in what would become a frontline force against the incursion and creeping influence of the French Québécois in Ontario. So, too, Irish workers were transported to construct the Rideau Canal in Ontario. Built during 1826-1832, the 202 km-long canal was carved out of virgin forest and built using nitroglycerine and primitive hand-held tools. The estimated death toll along the mosquito-infested marshlands between Ottawa and Kingston was over 1,000 Irish. Tragically, most who died did so needlessly. Quinine would have cured them, but the sectarian split between the Irish Catholic workers and their Protestant overseers – Royal Sappers (i.e. British army engineers) – meant Catholics’ wages were kept unduly low. This historical legacy of sectarianism in Ontario would again rear during the passage of the immigrant Irish of 1847. In Protestant stronghold towns like Cornwall, Prescott, Brockville, Kingston, and Cobourg, the influence of the Orange Order meant that the passage of immigrant barges through the summer heat of 1847 was not well-documented. The spectre of a mass grave at Cornwall was only recently discovered in archival records. Throughout my journey, I met with and interviewed local historians and commemorative memorial committees that have recently erected Celtic crosses to mark that fateful year. For many, the rediscovery of a historical event some 150 years past has opened deep psychological scars. 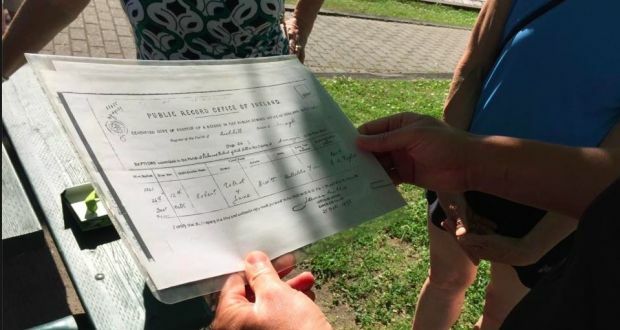 In an associated Facebook page I set up for the run, over 100,000 visitors, many availing of online genealogical resources, have added to the collective story of the passage and eventual settlement of those immigrants who crossed in 1847. The fated story of families separated through quarantine is a recurring motif. For a decade after the passage of 1847, notices appeared throughout Ontario with relatives inquiring after their loved ones. Indeed, for many of the diaspora Irish I met along the run, the ancestral passage to Canada and America, especially during the Hunger years, is still perceived as a form of exile connected to draconian British rule. In total, the Great Hunger accounted for the emigration of over a million and the death of another million. Even contemporary descendants far removed from the tragic departure of the Hunger years, when asked to reflect on their ancestors’ arrival to Canada, were more apt to characterise it as an exile rather than an opportunity. This theme of exile over opportunity accounts for a fierceness of national pride and an attendant encyclopedic knowledge of Irish history in those vested in preserving the legacy of that perceived exile. Over pints in snug Irish bars, I was versed on more occasions about a litany of Irish dates, from the 1691 flight of the Wild Geese to France following the end of the Williamite War, to the influence of the French Enlightenment on Wolfe Tone’s 1798 Rebellion. It was, more often than not, a dirge history of heroic struggle, defeat, and eventual exile. In these oft spellbinding oratory accounts of our collective history, time seemed arrested, and the historical grievances, yet again enlivened with a dramatic immediacy and flashpoint sectarian hostilities. The question surfaced with each encounter – what to do with such a history? What I can say of so many I met along the way on the run was that, for them, their Irishness was connected with an existential sense of self. Psychologically, their life in Canada directly relates to a traumatic ancestral leave-taking that many of them believe constitutes genocide. I was corrected repeatedly for using the word famine, and to deny them their right to tell that story as they see it would be to shamefully and consciously suppress their perceived historical reality. I felt at a quiet remove from this theme of exile, or I thought it constituted an older generational motif, but this recurrent theme would again be poignantly highlighted with my arrival at Ireland Park. My 12-year-old son Eoin wanted to sing to celebrate my arrival. Without prompt, he chose the haunting emigrant ballad, ‘The Parting Glass’ from his repertoire of Irish songs. Somehow, the notion of exile had registered at a subconscious level within him. What I heard in his voice was an eerie, plaintive ancestral lament for all that was lost or would soon be lost in a parting. It was as though the dead were speaking through him. He had a lilting tonal quality, which he must have heard voiced in the late great Irish singer Tomás Mac Eoin, whose rendition of ‘The Stolen Child’ was a staple song played in our house. Eoin Collins sings ‘The Parting Glass’ at Ireland Park, Toronto. After the ceremony, I quietly talked with Eoin. He could not articulate why he chose ‘The Parting Glass’. What I eventually gathered was that, for him, the story of Irish migration was not about arrival, but about leave-taking. He was caught reflexively looking back without having the insight or full measure of Irish history. Loss was the central motif of his Irishness. He talked about the sculptures at Ireland Park, interpreting the outreach of hands as reaching back toward Ireland, when they might have been equally interpreted as a beseeching, forward-looking gesture toward a welcoming Toronto. Where did this sense of loss emanate from? My son is no scholar of Irish history, and yet the undercurrent of great loss registered, not through a received history of the dates of rebellions and uprisings, but in the plaintive strain of a narrative carried on the warble of a tin whistle or the uilleann pipes. I realised just then that Irish history is mediated first and foremost through our music, through haunting airs of loss, and that, perhaps uniquely in this, our history is tied to a meta-narrative of loss that is transmitted pre-language. I had channeled this history of leave-taking as wake in my subconscious choice of an Irish soundtrack of ballads that played in our home. The subtle motif of loss was the essential theme conveyed. In the days since the end of the run, I looked further into the codifying loss and fell upon the aisling or vision poem. A uniquely Irish poetic invention, the aisling personified Ireland as either a maiden of immense beauty, or an old woman lamenting the loss of her children. That the aisling arose in the 17th century powerfully reinforced the Irish experience as a history associated with defeat and subsequent emigration, defined not as opportunity, but as exile and banishment. Indeed, even in the initial planning of the trip, I understood that a fundamental dilemma associated with retracing the path of the immigrants of 1847 would be balancing the commemorative emphasis of honouring the dead, while not reopening historical wounds. 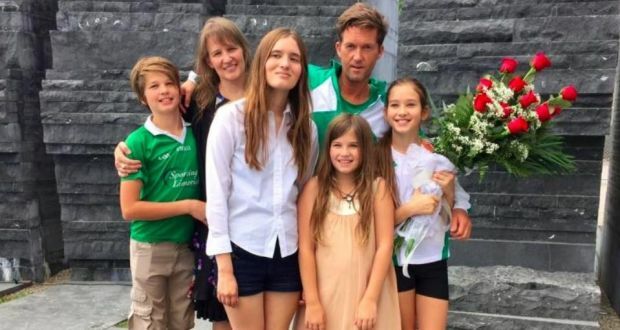 In reaching out to Irish diaspora groups via social media, I knew I was engaging in a sort of selective bias, and that, undoubtedly, the audience, in celebrating their ancestral Irishness, would most probably equally view their ancestors leave-taking as exile. The Facebook site associated with the run – Irish Diaspora Run 2016 – preserves the oft-heated responses of followers to historical articles I posted of what were then contemporary accounts and observations that reached back as far as the Reformation and the sectarian split between Ireland and England. In the course of a month, through posts and dialogue, I believe that those who most fully engaged with the historical evidence arrived at a greater understanding of the historical, sociological, and psychological, paradigm shifts in Economic Theory and Religion that tragically isolated and marginalised Ireland. In planning the trip in February, I had visited with Toronto-based Irish immigrant, Robert Kearns. With a degree in Archaeology and Greek and Roman civilization, Kearns has the authoritative grace and charm of a post-modern denizen committed to inclusion and multiculturalism. His Irishness encompassed Irish history, but he also offered a way forward beyond sectarianism and an arrested sense of an aggrieved and bloody history. As a leading figure in the Irish-Canadian business community, in the early 1980s, Kearns served on the volunteer committee of the Ireland Fund of Canada, which actively sought to raise money to promote peace and reconciliation in Ireland. Then, in 1997, Kearns turned his focus to the historical tides of the immigrant waves that had arrived in Canada. In establishing the charitable non-profit Ireland Park Foundation, he began lobbying Toronto for a quayside park which would eventually contain replicas of Rowan Gillespie’s famine sculptures on Dublin’s Custom House Quay Docklands. Kearns’ goal was to complete symbolically the voyage of coffin-ship migrants. Indeed, Ireland Park had been inspiration for my own Diaspora Run, and it was why I had asked to meet with Kearns. A decade earlier, while on a book tour in Toronto, I had been taken late at night to the park. The indelible image of the sculptures and their remote placement in the small parcel of Ireland Park suggested an accommodation of history within the bustle of urban sprawl. Without descriptive plaques detailing the history of Ireland, the sculptures simultaneously encompass and transcend Irish history. The sculptures speak to the universality of an immigrant experience that defines the settlement of the New World. In meeting with Robert on a snowy February day, I had felt that, perhaps, in his cosmopolitan vision, he was anticipating and engendering a reconfiguration of a national history, not as a source of differentiation, but as a source of shared experience. A day after the run, in revisiting the park with my son, the theme of exile was again on my mind. I had unduly influenced or seeded historical animosities within him. I sought to make amends, or reorient him. Prophetically, Kearns’ forward-thinking vision of history was on my mind. I explained that Ireland Park Foundation, in its logical extension of a broadening of history and commitment to encompassing a universality of shared values, was creating another park – Dr George Robert Grasett Park. To be unveiled in 2017, the park celebrates the Canadian response to the mass migration of Irish migrants in 1847, and specifically its medical profession. In addition to Dr Grasett, significantly the roster of those memorialised includes another male triage officer, Mr Edward McElderry, but also two women, head nurse Susan Bailey and nurse Sarah Duggan. All played an important role in the medical history of the city and furthered the foundation of the modern Canadian healthcare system. In thus explaining the new park, I think my son caught the essential and subtle re-orientating genius of a universalist like Kearns, who is advancing the totality of our collective experience, seeking to steel our resolve to rise in defense of justice, promoting tolerance and universal acceptance. In the strangest of coincidences, hours after revisiting Ireland Park, I got a Facebook message of congratulatory thanks for sharing the Irish plight of 1847 from a First Nations’ clan leader of the Hotinoshonni Confederacy Council of the Iroquois Nation. The clan’s point of connection was tied to their fellow Choctaw, who had suffered their own near-genocide in 1831, when over 21,000 of their people were made trek 500 miles to Oklahoma on what became known as the infamous Trail of Tears. In 1847, the Choctaw, upon hearing of The Great Hunger, raised and sent funds to Ireland. Ironically, the man who had forced them off their lands was Andrew Jackson, the son of Irish immigrants. Of course, my son was enthralled that the Iroquois Nation had thought to contact me. He wanted to know about the Trail of Tears, and, in the subtle connection of one kindness bestowed on one people so long ago, an emerging history opened to him. A recognition and preservation of national histories is important, but equally so is our willingness to use our histories as a point of reconciliation, as we collectively advance a greater universality of understanding and compassion. In so doing, we find accommodation and assimilation, losing nothing, while gaining everything. In the week since ending the run, I have felt the quieting distancing of all those who followed me for the month. I miss all of you. 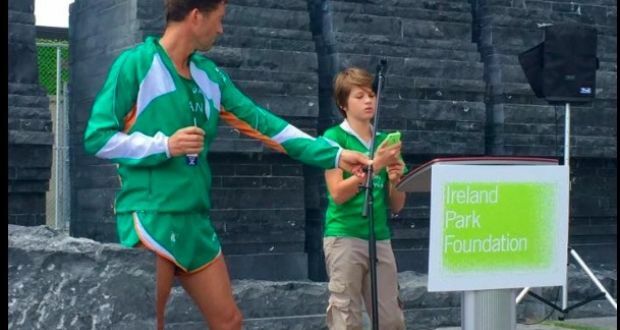 The run was first envisioned as a solitary act of pilgrimage, but in having the support of The Irish Times and a grant from the Irish Government, along with the reach of social media, some 100,000 of us connected, and we are the better for it. For those who didn’t join us, the legacy of what was said is still preserved on Facebook at Irish Diaspora Run 2016. My intention is to continue updating the site. I’m currently in discussion to run the length of Ireland and possibly continuing with a Diaspora Run in Australia. In so doing I would visit historical sites associated with Irish migration, while collating a digital repository of historical documents and continuing to invite followers to share their family stories. 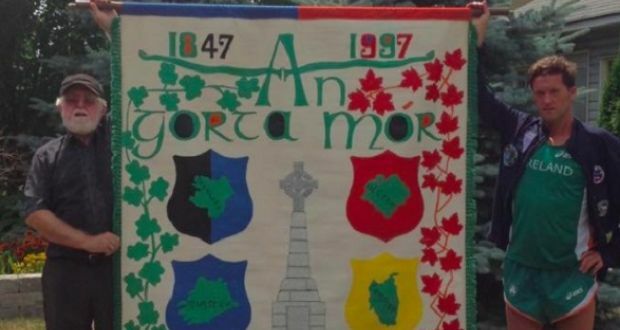 If anybody is so inclined, donations are still being accepted for the two non-profits I designated to help – The Montreal Irish Memorial Park Foundation and Ireland Park Foundation. Both are independent, non-affiliated organisations. Donations can be made at diasporarun.org. I would ask people to consider sponsoring a symbolic 47 dollars in commemoration of 1847. Michael Collins at Rowan Gillespie Famine Monument in Dublin after Irish Diaspora Run 2016. Until we meet again, thank you for all your support. This project was supported by the Department of Foreign Affairs’ Global Irish Media Fund. Michael Collins on the Saint Lawrence shores, Kingston, Ontario. Birth from 1841, Brockville, Ontario. Loyalist Parkway outside Kingston, OntarioFounder of Grand Orange Lodge, Brockville, Ontario. Founder of Grand Orange Lodge, Brockville, Ontario. In my most successful novels, there is, early on, if not the absolute awareness of the totality of what the novel will encompass, then at least the narrative arc of a beginning and an endpoint. The yeoman’s work of each day is then measured in scenes and chapters toward that distant endpoint. My ultra-running life parallels the same structural arc. The difference being that, instead of moving through scenes and chapters, I psychologically compartmentalise a 100-mile race into manageable stages, 20-mile stages, further broken down into five-mile stages. As with all successes, on the page or on the road, the absolute alignment of varying elements is essential. I begin my novels with the onset of falling temperatures, in an advance on a literal and figurative darkness, psychological exploration and narrative indeterminacy aligned with the meteorological outlook of a day or a week. I write against anticipated storms and the barometric pressure of the frontal lobe. This psychological alignment with the actual forecast is doubly reinforced, given that I use ultra-running as a sort of psychological clearing-house to better process and understand my characters. That my high-mileage runs take place in the freeze of a Midwest American winter directly influences the essential urgency and desperation of my characters. For me, the measure of success on the page always correlates to a heightened psychological anxiety induced through a physical exhaustion of miles run. I say all this, since it is no different on this journey. When I first read of the passage of 100,000 dispossessed Irish, evicted and forced into exile aboard the infamous coffin ships, I locked on the narrative arc of an encapsulated history that began with the arrival of ships in the Saint Lawrence in early May of 1847 and ended with the icing of the Saint Lawrence in late October. So, too, the singularity of the route, the distance travelled, some 900 kilometers along the Saint Lawrence from Grosse Île quarantine station down through Montreal, Cornwall, Kingston, and Toronto, fell into the domain of what I felt I could manage in a month-long run. Over halfway through the journey now, and in allowing momentary reflection, in the survey of that initial history of 1847, I can only describe the feeling as the appointed hand of providence. How often is one compelled to bear witness vicariously to the most tragic and damnable episode of Irish subjugation – a forced emigration that would spawn the second greatest loss of life in the Victorian era and eventuate in the death of some 20,000 souls flung into the Atlantic or interred in mass graves all along the Saint Lawrence? I’ve written in previous weeks of the sullen and cruel facts of 1847, most notably prime minister Russell’s decision to end British famine relief, while shifting the feeding of the Irish to an insipid class of absentee landlords, who, in summarily pushing through the infamous Gregory Act, shirked responsibility for providing relief by simply evicting their tenants. No doubt, it is along this fault line of direct parliamentary acts that the charge of genocide has been leveled against the British. So, too, historians can point to the sinister policies of the British, who, after America passed a series of Passenger Acts forestalling the sailing of disease-ridden ships, landed upon the grim idea of retrofitting empty lumber mercantile ships returning to British North America to carry a human ballast across the ocean to an unwitting and ill-prepared population. If one is in doubt as to the absolute collusion of British officialdom with the absentee class of landlords, one only has to view the public record of the foreign secretary to Ireland, the landed Lord Palmerston, who, acting on the advice of estate agents and championing enclosure, evicted some 2,000 of his tenants and then shipped them to Canada aboard ships that one Canadian official compared to conditions aboard vessels used in the slave trade. 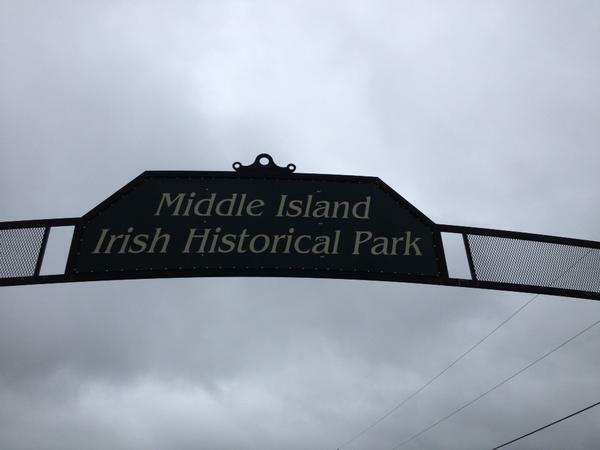 For me, the retracing of 1847 has all been about compartmentalisation – the totality of the experience first envisioned with a starting point at Grosse Île quarantine station and an endpoint at Ireland Park, Toronto. The harrowing details and particulars of that passage along the Saint Lawrence suggested early on a natural narrative divide – the reception of the Irish into Québec by the religious community and then the further passage of the remaining Irish into the sectarian waters of Ontario. How could one not divide it otherwise? With just a cursory overview of the map, Ontario declares its British-leaning sensibilities with towns named Kingston and Loyalist. 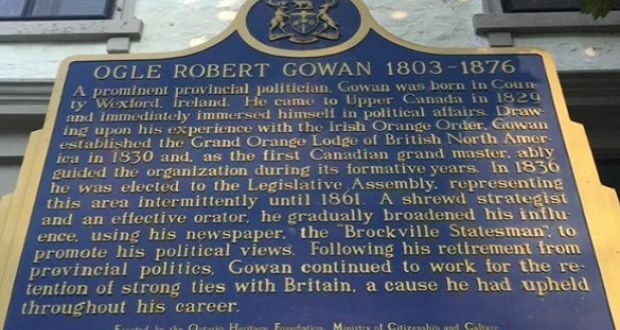 In Brockville, I came across an infamous Protestant Irish transplant and native of Wexford, Ogle Robert Gowan, who established the Grand Orange Lodge of British North America in 1830. Before his emigration to British North America, Gowan had led a Protestant militia called the “Black Mob”, which had been accused of committing atrocities against Catholics before and after the Wexford Rebellion. His leaving Ireland was motivated by the passage of the Catholic Emancipation Act. These few details underscored a subconscious parsing of histories, providing a natural demarcation of a journey – Lower and Upper Canada, Québec and Ontario. And so it was that the narrative arc and the division of miles were thus established early on. Since beginning this journey I’ve thus watched for omens of alignment that correspond to that narrative divide of Lower and Upper Canada. The anomaly of a cold, wet weather front that settled with my arrival at Grosse Île aligned with a cosmic sympathy. I began my run into a quintessential wet, wind-blown Irish day. If I was in search of a deep alignment with hardship, it was granted me in the push toward Montreal. Misery held! The fourth straight marathon commenced against a headwind and a downpour of lashing rain. Temperatures fell below 10 Celsius. Draped in sheets of rain, the sweeping Saint Lawrence might as well have been the Shannon, facilitating a surreal conjuring and correspondence with untold dead. So went those early days into a deadening solitude of miles run along the languid sweep of the Saint Lawrence out along Chaudière-Appalaches, where so many orphaned Irish were adopted by the French-speaking Québécois, simply because of a sympathetic alignment that both the French and Irish were Catholic. The passage of the Irish in 1847 was a providential test of faith that emptied the cloister of so many religious orders that provided salvation and succor in a sublimated religious war waged over the salvation of Catholic souls. Into the dreamscape isolation of rural farms along the Saint Lawrence I eventually found myself struck by roadside religious shrines that harkened to an older Irish-Catholicism. 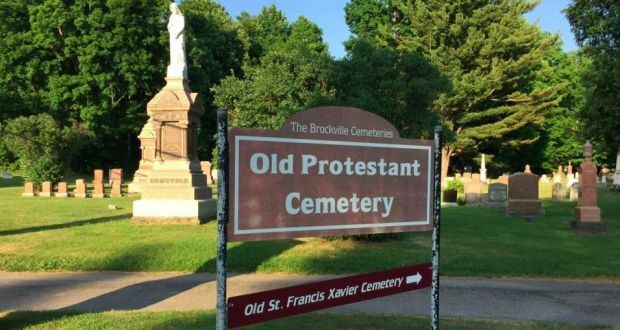 The narrative here was the merciful intersession of the religious throughout the province of Québec. Martyrdom encapsulated the religious edict to minister to the poor. Again, it was the annals of the Grey Nuns that offered insight into an almost medieval religious psyche that firmly established the temporality of our earthly life, and how deeds alone in this world were how one would be redeemed in the afterlife. What I confronted in reading about the passage of pestilence through Québec was a testament to one of the last great religion-inspired acts that would so soon be eclipsed by a modernist paradigm shift toward clinical epidemiology as a frontline defense against disease. All the accounts I read prior to beginning the run extended beyond mere reportage and broached a polemic condemnation of what had so recently unfolded at the time. From the Montreal Immigrant Society Bulletin 1848, the description is damningly direct, and yet hauntingly poetic, in eulogising the passing of so many souls. From Grosse Ile, the great charnel house of victimised humanity, up to Port Sarnia and all along the St. Lawrence and the Great Lakes, where ever the tide of immigration extended, are to be found the final resting places of the sons and daughters of Erin–one unbroken chain of graves where rests fathers and mothers, sisters and brothers, without a stone to mark their spot. I do not know that the history of our times has a parallel for this Irish exodus. It was the forced expulsion and panic rush of a stricken people, attended by frightful scenes of suffering and death. This account of suffering echoes a familiar, plaintive, and damning tone expressed in reports from Ireland by observers that were read before the British parliament during the early spread of the potato blight in as early as 1845. All such reports fell on willfully deaf ears, the reflexive parliamentary response being that all accounts of the Irish situation were prone to exaggeration. I reached the Québec/Ontario border in the early hours of morning, after a night of electrical storms and driving rain. Psychologically and physiologically, this was the point of natural divide. The first major town along the Saint Lawrence on the Ontario side, Cornwall, declared itself as quintessentially British. The death of some 5,000 at Grosse Île quarantine station and the further interment of over 6,000 Irish in a mass grave in Montreal, along with the concerted effort of the religious community to place over 3,000 orphans within Quebec’s Catholic communities, meant the flotsam of Irish who survived had been afforded a measure of care and might survive the rest of the passage to Toronto. Frankly, from a narrative standpoint, I was at a loss in entering Ontario. It was not so much that I had neglected studying the history of Ontario’s reception and treatment of the Irish, as it was that there was less compelling and historical evidence readily accessible. My plan was to push through the summer heat of Ontario in a tally of mounting miles. This plan would change. Given my use of social media to highlight my run, and specifically a dedicated Facebook page titled Irish Diaspora Run 2016, not long after crossing into Ontario, I was contacted by a host of Celtic heritage organisations who had begun ad hoc historical and genealogical projects that coalesced around informal websites of aggregated genealogies and historical links that described waves of Irish immigration to British North America. Less sensational, shocking, and compelling than the encapsulated immigrant flight of 1847 through Québec, these ad hoc amateurs had begun to describe a complex settlement of British North America that included the transplantation of Irish from Protestant estates as early as the 1820s. Indeed, in first entering into dialog with these groups, I was directed to recently sourced material that provided a foundational history of the active transplantation of returning soldiers of the Napoleonic Wars, who, as ardent loyalists, had been lured to British North America with land grants. Their presence was two-fold, to populate the country, but also to bolster a frontline militia against American territorial claims. With the soldiers came a grunt labor of Irish to support the backbreaking construction of an infrastructure of roads and canals. Many of the groups who contacted me traced their ancestral roots to the Protestant Ascendancy in Ireland, while others guardedly revealed that their ancestors, under the persistent pressure of sectarianism, had converted to Protestantism. What I would determine in meeting with groups along the way from Cornwall to Kingston was that there was a recuperative effort underway to firmly establish the role of the Catholic Irish in settling Ontario. The passage of the immigrants of 1847 was, in some respects, the least impactful immigration of the Irish in Ontario, since many of the 1847 immigrants were set on reaching America. What I have learned, and what is being further explored online, is a more entrenched and impactful wave of immigrant Irish who have their own fateful history. In the building of the Rideau Canal, an indentured Irish class succumbed to malaria at extraordinary rates, while their British counterparts had access to quinine. Such was the surfeit of Irish labor and disregard for Irish lives. Among the sprawl of emerging histories is genealogist Annette Code’s project detailing the assisted emigration from Lord Fitzwilliam’s Estate that began in the 1820s and ensured sufficient labor to build the Rideau Canal. Attendant to this assisted emigration was the discovery of what has been dubbed the McCabe list, named after genealogist John McCabe. Signed by roughly 673 Irish canal workers, the petition begged government intercession to secure assistance for their relatives to make the passage to British North America. At a festival at the aptly named Skeleton Park, I was invited to speak about my drive to raise awareness regarding the 1847 passage of the Irish. The park, a former graveyard, is the resting place of some 1,400 Irish who died in 1847, along with Irish who numbered among the 1000 Irish who had died building the Rideau Canal decades earlier. A Celtic cross had been erected by a small band of tenacious ecumenical historians committed to preserving the historical realities of Irish immigration in 1847. Less than a mile away, another Celtic cross had been placed alongside the Rideau Canal. Further back along the route, in Cornwall, I had met with members of the Cornwall Irish Memorial Committee, who, after receiving public records dating to 1847, realised that Cornwall had been the site of a fever hospital to some 250 fever-ravaged Irish. The names of the medical doctors and nurses who attended to the Irish are duly remembered. In honor of the dead, the names of the 52 people who died are now engraved on a newly erected Celtic cross. The Cornwall memorial is testament to the emerging influence of local historical societies who now have access to digital records. They are piecing together a lesser-known history, but one that better explains the totality of the Irish experience in what was then British North America. In Brockville, I was invited to meet with a contingent of Canadian-Irish at Block Island, a former cholera quarantine island that the committee quietly suggested must have served as a quarantine facility during the summer of 1847. Steeped in the heart of Orange territory, the historical record is silent, but a passionate Nattanya Hewitt of the Brockville Irish Cultural Society wanted to show me a photocopy of a birth certificate of an ancestral Robert Hewitt, who was born in the County of Armagh in 1841. She determined that Robert must have made the journey along the Saint Lawrence with his family, before settling at Orangeville. Hewitt said she had only recently began researching her family background, and that her Irish background had been overshadowed by her grander, English roots. She was determined to set the record straight and assert her Irish heritage. 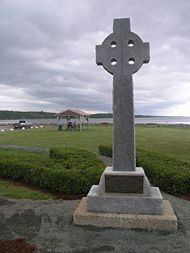 In the memorial crosses erected across Ontario to the memory of 1847, there is a recognition of the untold suffering the Irish endured, but so, too the equal recognition of the grace and merciful deliverance of medical assistance by a predominant class of Protestant doctors who looked beyond creed and race and acted in good conscience. I have run now as far as Kingston, and the narrative arc of the passage of the 1847 immigrants has opened into the brackish waters of convergent tides of Irish immigration that predate the infamous events of 1847. Indeed, 1847 is one chapter of the grander story of the Irish experience in what was then British North America. My Mum’s people were Kingstons from Bantry Bay. .. Paul Kingston left Bantry Bay in 1826. And my Dad’s people, people down in Wicklow, presented me with a beautiful book with my complete family history saying that my great, great grandfather was James Vickers would have left Arklow [in 1847]. Minister Charlie Flanagan would take exception to that because he is pretty sure that I come from County Laois, and there is in fact a James Vickers who did leave Laois in 1827. Whether I am going to call myself a Wicklow man or a Laois man I am not too sure. Where I am from in Miramichi, New Brunswick, it is all Irish. The names are all Irish: Shanahan, Flanagan, O’Neill, Butler, Murphy, O’Shea… [In Ireland] it feels like I have come home. It really feels like home. In my home town there is a Celtic Cross on Middle Island. In 1847 three ships arrived from Ireland, and there are 240 people buried on the island, Middle Island, and we grew up with that… During the Famine in 1847 was the worst year. The three ships involved , the Bolivar, the Richard White and the Loostaulk, their crews were overcome with typhus and cholera, and they had to make for the nearest port. So they arrived at our home town. But the river pilots refused to get on board the boats, because there were so many corpses on the decks. When they finally were allowed to come up and dock at Middle Island, in the first week there were over a hundred people who further passed away. It is two hundred and some odd people altogether who are buried there, in Middle Island, where we have this large Celtic Cross. In Canada we are now on track to receive 25000 refugees by the end of February, and we may get up to fifty thousand by the end of the year. Between the forties, fifties, and early sixties in Canada we had three hundred and fifty thousand Irish people arrive on our shores. There is an island in the St. Lawrence, Grosse Isle, with over five thousand Irish people buried on it who were overcome with cholera and typhus. So it is a big part of our history. Some people do not realize that seventeen percent of our population in Canada, like me, claim direct descendancy from Ireland. That would be roughly seven million people, a third again of the population from Ireland. That is part of who we are. The Canadian Ambassador to Ireland, His Excellency, Kevin Vickers, was “very honoured and exceptionally humbled to have the profound pleasure to be back in my ancestral homeland,” when he enthusiastically addressed guests in the Library of Coollattin House, near Shillelagh, for the launch of the Coollattin Canadian Connection. The event was organised by Old Coollattin Country Ltd and is aimed at promoting a number cultural, social and tourism links between Wicklow and Wexford with Canada, stemming from the large number of local emigrants who took the ships from New Ross across the Atlantic between 1847 and 1853. 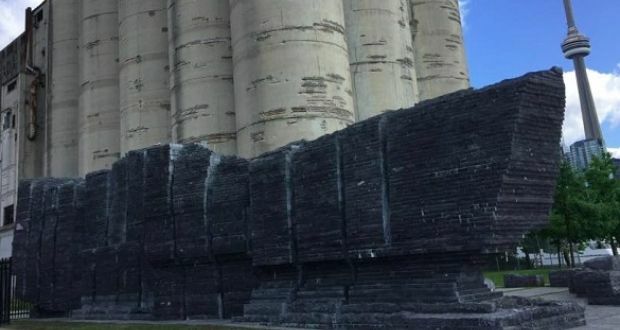 Ireland’s Minister for Arts, Heritage and the Gaeltacht is visiting New Brunswick this week as part of this year’s International Famine Commemoration. Heather Humphreys is making stops in Saint John, Miramichi and Moncton to pay tribute to the people of Canada who helped Irish immigrants flee the great potato famine of the 1840s. Approximately one million people died between 1845-1852, and a million more left Ireland forever. “It’s very important that we remember and look back, because there’s so much famine across the world and I think by having these commemorations, it raises the awareness of famine issues in the modern world,” Humphreys said Friday on Information Morning Saint John. Of the more than 100,000 Irish who sailed to Canada in 1847, an estimated one out of five died from disease and malnutrition. In Saint John, up to 2,500 people were quarantined on Partridge Island with small pox and typhus fever during the peak of the Irish immigration. The island was an entry point for newcomers to Canada. Approximately 600 of them are buried in a mass grave on the island. Other Irish immigrants eventually settled in New Brunswick, Upper Canada and the United States. “I’m here to say thank you to the Canadian people for the compassion their predecessors showed … because the devastating legacy of the famine is evident across the eastern region of Canada, where up to 20,000 Irish famine victims lie buried,” Humphreys said. Humphreys will lay a wreath at noon at St. Patrick’s Square in uptown Saint John on Friday. She will then travel to Miramichi on Saturday, where she will visit Middle Island at 10 a.m., and meet with Bill Fraser, Minister of Tourism, Heritage and Culture. Humphreys will also visit the Irish Families Monument at 2 p.m. in Moncton and then move on to Prince Edward Island on Sunday. She previously made a stop in Halifax. “It’s a solemn occasion to remember, and when you think of the journeys they went on, it’s quite harrowing … it’s important that we remember what they went through,” Humphreys said. The first National Famine Commemoration Committee was established in July 2008, following a government decision to commemorate the Great Famine with an annual memorial day. Since 2009, the program included an annual International Famine Commemoration at a location abroad. 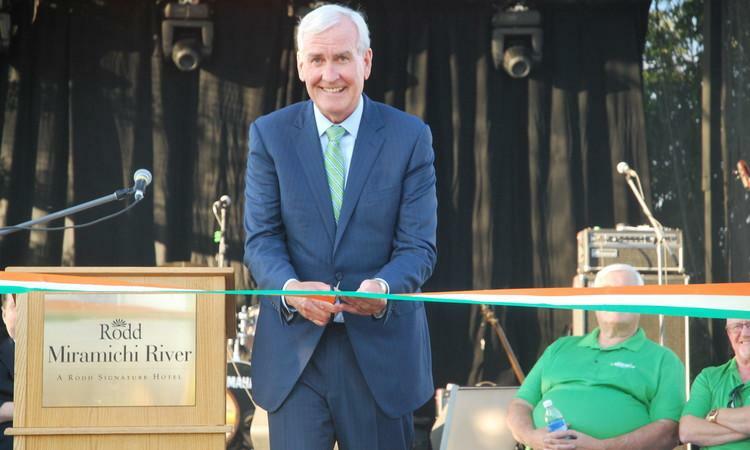 On July 18th, Canada’s Ambassador to Ireland, Kevin Vickers, also spoke about the Famine Irish in New Brunswick when he opened the 32nd Miramichi Canada’s Irish Festival in his home town.